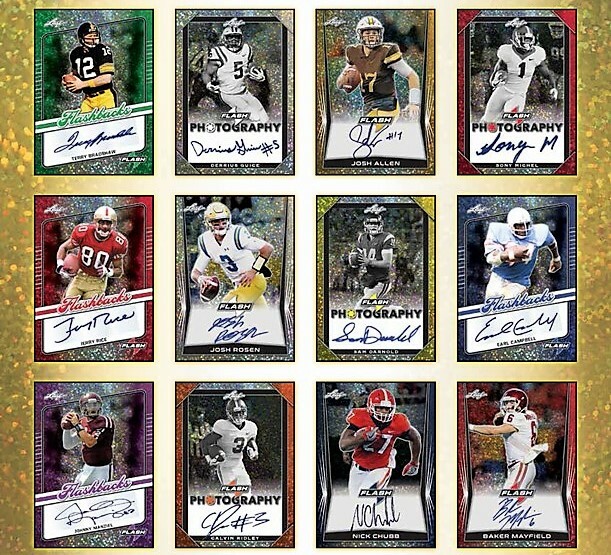 2018 Leaf Flash Football may be a new line for the company’s portfolio but cards come with something common in their other hobby sets — autographs. Every card in the product comes signed. That's five (rookies are on-card autographs) autographs per box for just $99. And while the 2018 draft class plays a key role on the checklist, 2018 Leaf Flash Football includes in signatures from retired stars (Terry Bradshaw, Jerry Rice, Earl Campbell, Y. A. Tittle, Jim Otto, Lenny Moore, etc.) as well. Each box of 2018 Leaf Flash Football comes with five cards. All are autographs. The set gets its name for the bright spotted backgrounds on the cards that add a certain level of pop. Base Autographs center around 2018 rookies. Like earlier sets from the company, such as 2018 Leaf Metal Draft Football, the emphasis is on offensive positions like quarterbacks and running backs. Additional autographs come in a couple of themes. Flash Photography uses black and white images. Meanwhile, Flashbacks is where the retired player content comes in. Jerry Rice, Terry Bradshaw and Earl Campbell are among those signing for the 10-player set. 2018 Leaf Flash is extremely limited. Production is less than half of the Leaf Metal Draft product. Based on 2018 Leaf Flash checklist, approximately 293 cases were made. So go to Sports Cards Plus on Tuesday and pick your box of 2018 Leaf Flash Football from the THREE BEST CASES in The Hobby.